Food demand throughout the world is growing rapidly with estimates that world population will reach 9.1 billion by 2050. To meet that growth, the world will need to increase its global food production by 70% according to the Food and Agricultural Organization of the United Nations (FAO). Given the existing strain on farmland and natural resources worldwide, we cannot simply expand the amount of farmland and expect this global challenge to be solved. With the traditional farming workforce declining and the lack of access and affordability of starting farms keeping many new farmers away, it is necessary to look at new solutions and new approaches to food production. Much of the solution to date to increase the food supply has involved shipping our food farther and farther. On average, an apple could travel over 1,555 miles and has typical storage time of 9-12 months. Does a year-old apple still keep the doctor away? According to Brian Halweil at Worldwatch, “the farther we ship food, the more vulnerable our food system becomes.” It’s estimated that foods are losing up to 45% of their nutritional value during transport and that 23.5 million people in the U.S. have limited access to fresh, affordable, healthy foods – living in “food deserts”. So not only does our means of production need to change, but we also need radically rethink our means of supply chain and distribution. Wouldn’t it just be easier if we could grow the food right next to where it was going to be consumed, and do so with available land that, heretofore, would never be considered for agriculture? Well we now can through the advent of high production indoor farming. The solution to many of our food challenges “can be achieved by investing in technology, thus helping increase food production without compromising quality,” says Charles Sissens, Analyst with Global Data. The technology behind indoor agriculture not only has the opportunity to make healthy, fresh food accessible, but there are tremendous advantages to the growing process itself. Indoor agriculture is a controlled environment that enables year-round production, with meaningful reductions in the use of pesticides and herbicides, and substantial reductions in the use of water. It’s estimated that indoor growing, on average, uses only about 5% as much water as conventional farming. The combination of the environment and technology means indoor growers can produce yields approximately 7-32 times that of traditional growing, depending on the crop. One such group with a vision to bring the value of indoor agriculture to its community and beyond is the Farmory, a campaign to bring local, sustainable, and indoor agriculture to downtown Green Bay and the larger Northeast Wisconsin region. 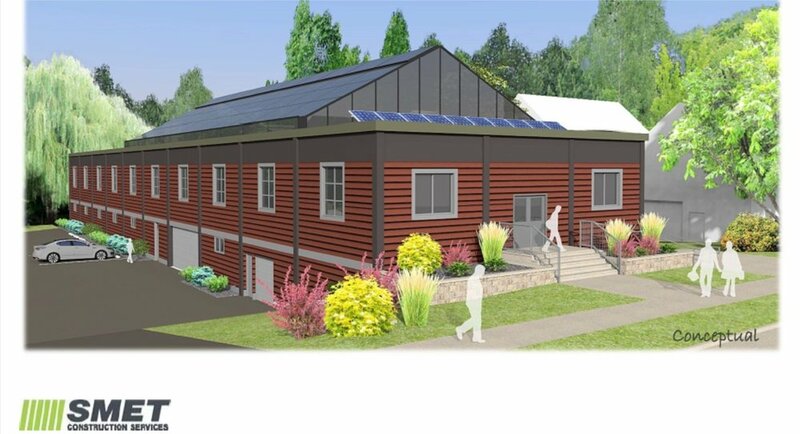 By converting an empty former armory building into a 20,000 square foot indoor vertical aquaponics farm and fish hatchery, this non-profit will offer fresh fish and produce year-round, and provide area residents with job skills, entrepreneurship opportunities and educational resources on high tech agriculture careers and sustainability. The Farmory’s team is working to invigorate the local food system on the institutional level and is already producing and distributing 200 pounds of organic, sustainably grown food per year, with just one small grow system in operation. Once fully operational, the Farmory will be producing over 100,000 pounds of mixed salad greens and 40,000 market sized yellow perch per year. In addition, The Farmory will provide up to 700,000 fingerlings to prospective fish farmers in the area, invigorating the local aquaculture and aquaponics economy. Food from the Farmory is already being sold to local schools and restaurants. As part of its approach, The Farmory is located in the urban center of Green Bay and puts great value in partnerships, community connections, and the power of volunteers. For example, through hands-on volunteer opportunities, classroom lessons, and workshops, The Farmory inspires people to grow food and consider a career in agriculture. The Farmory’s high tech vertical aquaponics systems will be cared for by 200 volunteers year-round. This will enable community residents of all ages and abilities to learn skills and get hands-on training in an urban farm. Another important partnership is in the research and development of the growing systems themselves. The Farmory is a nonprofit social enterprise that has relationships with the University of Wisconsin – Green Bay and other institutions to become a real living laboratory for new applications in sustainable aquaponics and agricultural systems. One of the most important factors in any indoor agricultural system is lighting. Some farmers may be hesitant about indoor growing, expecting huge expenses from both energy costs to run the lights and cooling requirements to dissipate the heat they create. Traditional indoor ag lighting, such as High-Pressure Sodium (HPS) lights require extensive amounts of electricity to operate (up to 1000W each), including a large electrical infrastructure to handle such electricity demand. They are also extremely hot, reaching up to 750 degrees on the surface, and raising room temperatures 15-30 degrees (which then has to be addressed through large and expensive air conditioning infrastructure). However, not all lighting is the same. Violet Gro LED lighting, which is currently partnering with the Farmory on improving their growing design, believes in finding ways to improve the system economics of growing by reducing a farmer’s total cost of ownership of lighting. Violet Gro’s patented technology enables the LEDs to be in direct and immediate contact with our specialized lens material. This cutting-edge design provides plants with more light at lower energy usage and with minimal heat production. Projected cost savings for Violet Gro lights over traditional lighting are up to 70% while still providing the spectrum of light needed to produce optimal plant growth and vibrancy. Another great aspect of the partnership with Violet Gro is their knowledge and understanding of ultraviolet light, which can be used to trigger specific plant responses, such as increased nutritional, taste, and medicinal compounds as well as improving the ability to control plant mildew, mold, or other pests – reducing the need for pesticides and herbicides. Learn more about the value of UV LEDs for agriculture in Violet Gro’s article in LED Professional magazine. Aquaponics also benefits from UV light by helping disinfect and protect against plant algae or other bacteria in the water. Violet Gro hopes to partner with The Farmory to research and develop a UV light solution that will not only protect the farm and aquaponics systems but will also avoid some of the pitfalls of legacy UV systems in terms of efficiency and maintenance requirements. Since the lens used by Violet Gro will not foul and degrade over time, you should experience a longer lifetime and less maintenance than other similar solutions. To learn more about The Farmory and their mission, visit www.farmory.org and for more information on what makes Violet Gro lights stand apart, visit https://www.violetgro.com/experience-the-violet-gro-difference/.